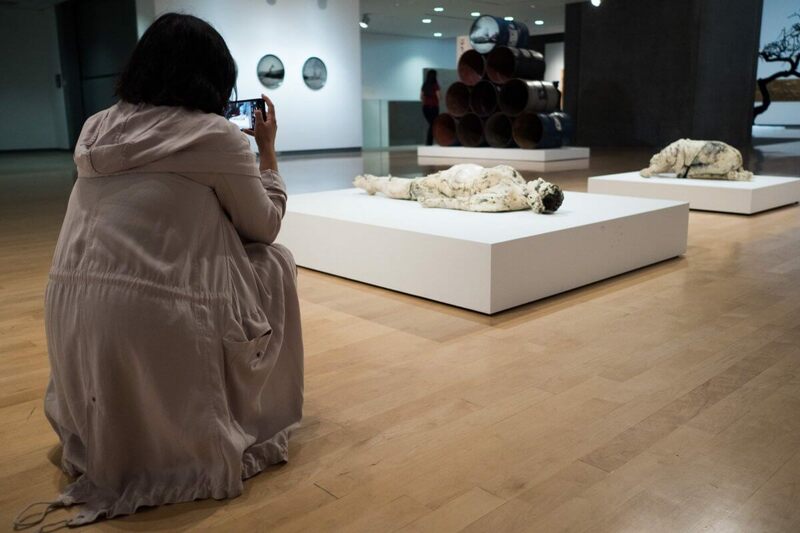 Seen at the Phoenix Art Museum: a couple takes a selfie with one of Patricia Sannit’s many ceramic head-like forms. 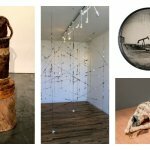 No doubt the artist would be pleased, because Sannit is all about connections — people making one-on-one connections with her work as well as connecting it to the ebb and flow of humanity going back thousands of years. 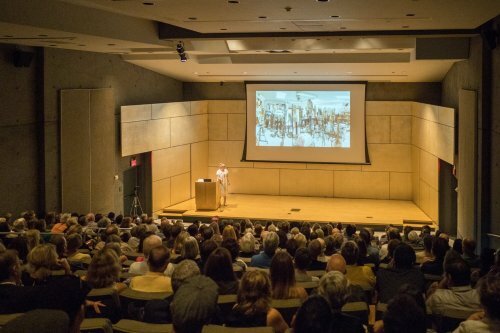 It was a full house at the museum on Wednesday evening as Sannit gave a short talk as part of winning the 2016 Arlene and Morton Scult Contemporary Forum Artist Award, which recognizes mid-career Arizona artists. The Contemporary Forum grant enabled Sannit to take a year to put together her just-opened solo show “Rise Fall Rise.” Intelligently executed, it’s an excellent demonstration of ceramics moving beyond polished and elegant shapes to organic, earthy installations in order to convey a message. 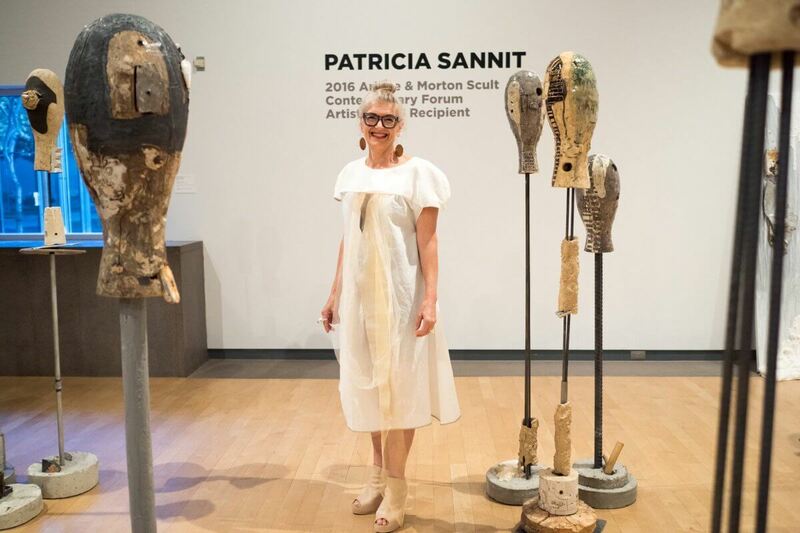 Sannit presents at Phoenix Art Museum. 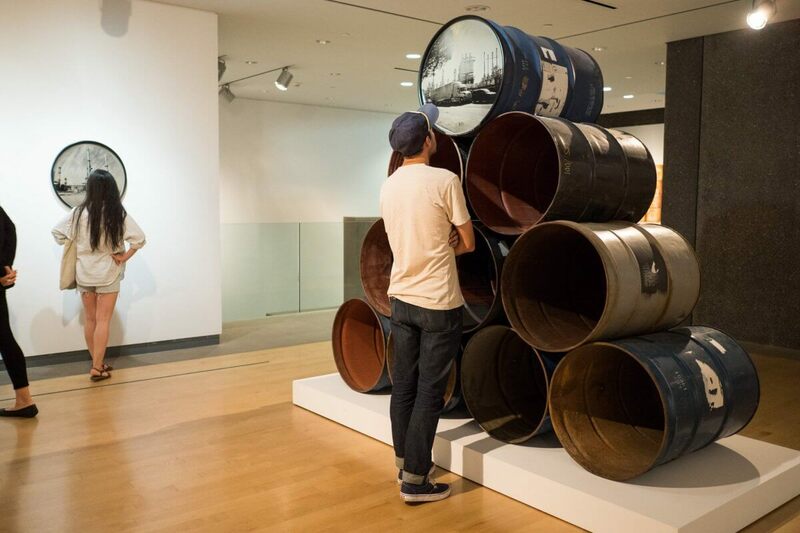 Sannit’s talk focused on the many influences on her work, including the study of ancient civilizations and seeing how the synergy between destruction and creation brings both sorrow and beauty. 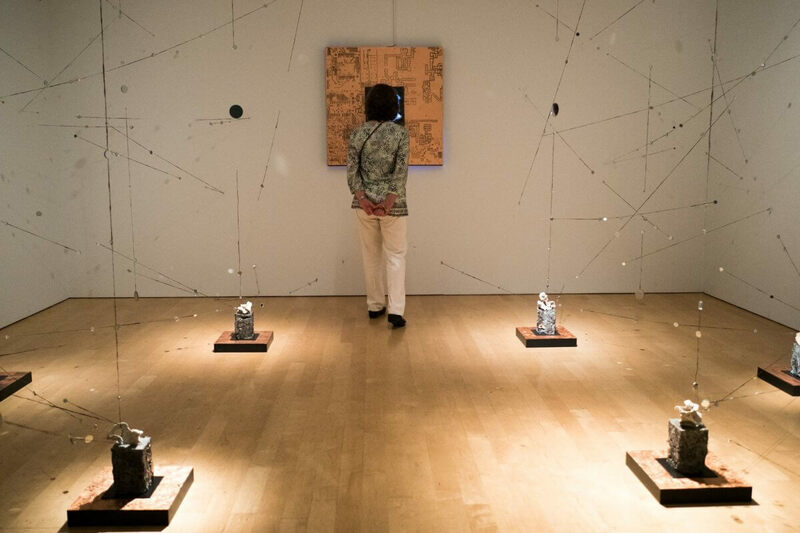 “The world is one,” Sannit told the audience in explaining the overarching philosophy of her art practice and the idea of connections across time and space. Life cycles are also a recurrent theme, as seen in the many instances Sannit plays with circular ceramic forms or uses raw, loose clay that is meant to deteriorate over time. “Rise Fall Rise” has three main sections: The first is a large gathering of human-like clay totems through which viewers can roam, stopping to admire the way the totems are decorated and “dressed,” with found objects, rebar, incisions into the clay, holes, occasional dashes of color, and all kinds of clay protrusions. Also worth studying is the way the details might relate to historical and current events. The second is a circle of 17 primitive, head-like forms on rusted tripods, where viewers can see details but cannot enter the circle. 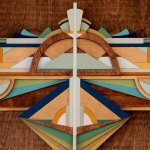 The third is “Slow Time,” a series of wood panels leaning against the wall on which Sannit has let plaster, beeswax, paint and glaze simply glob and drip randomly down the surface. Viewers did indeed spend time with all the work — and take pictures. “The Hand of Man, Homage to Alfred Stieglitz” by David Emitt Adams. 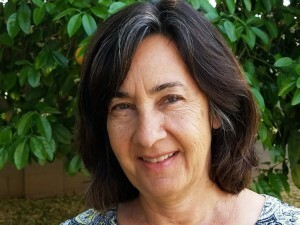 Christine Cassano is interested in connections between biology and technology and how they might reverberate into the future. The Contemporary Forum grant enabled the mixed media artist to create an installation called “Tethered Tensions.” Using spun strands of her own long, dark hair contrasted with clear filament, Cassano stretches several lines from point to point in a small darkened room, and enhances its otherworldly quality with concrete “fossils” and small mirrored discs that bounce light around. The installation calls to mind a constellation pattern. “Tethered Tensions” by Christine Cassano. 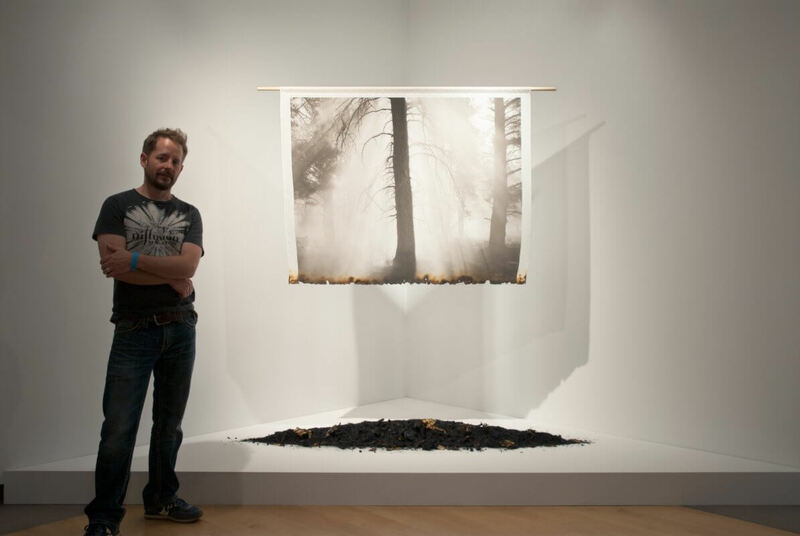 Artist Bryan David Griffith with “The Impermance of Forests.” Courtesy of the artist. 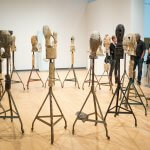 Constance McBride looks at human connections across generations, with ceramic figures that comment on the transience of youth by celebrating the beauty of bodily decay. 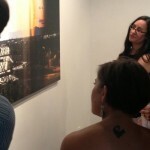 Her work, “Truth From Within,” is a floor piece with figures lying face down and face up. Hauntingly, they give the appearance of having their flesh sutured together. 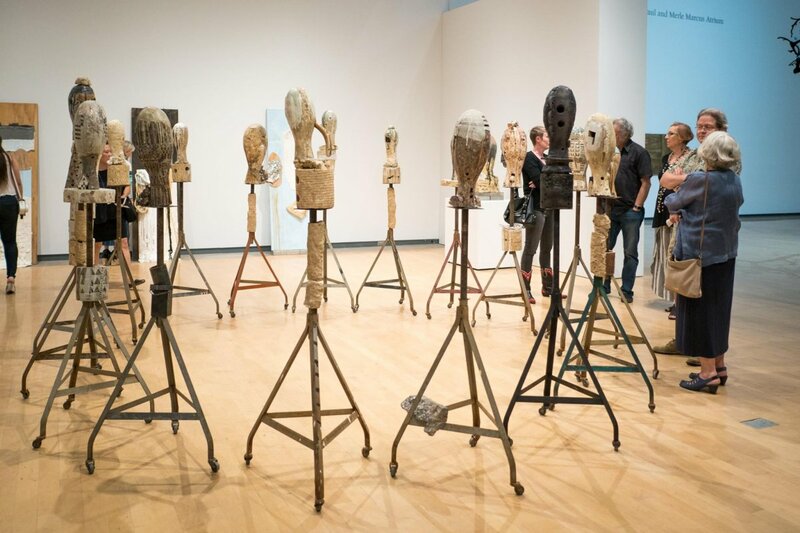 Also interesting is the way McBride has hollowed out the heads, further evoking decay. “Truth From Within” by Constance McBride. 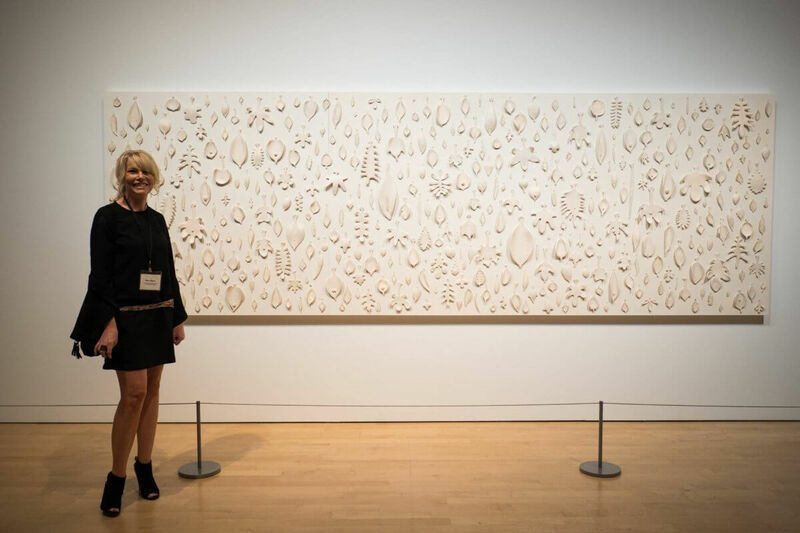 Mary Meyer’s frieze-like wood panel called “Biophilia (leaves)” reinforces the artist’s connection with nature. It is an ordered menagerie of white porcelain “leaves” in various shapes and sizes. Interestingly, the leaves are pinned to the panel with sewing needles. 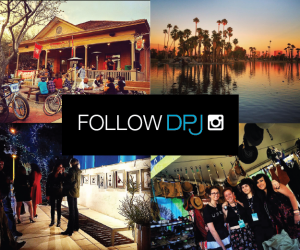 Phoenix residents who want to make their own connections to the works in the Contemporary Forum show — with selfies perhaps (no flash, though!) 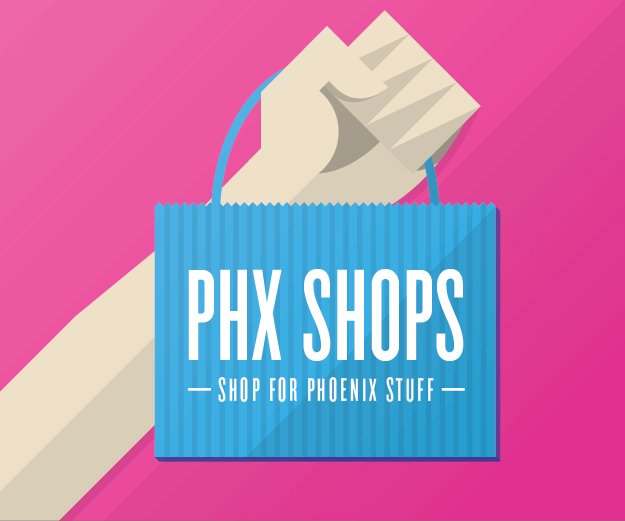 — should head to the Phoenix Art Museum by September 17. The show is prominently displayed and easy to access on the first floor. 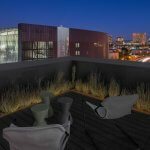 Photos courtesy of Phoenix Art Museum, unless otherwise noted.